The forces of the Rebel Alliance are scattered throughout the galaxy, often cut off from other supporters of the Rebel cause. Seclusion is necessary—if the Empire could easily locate the Rebel forces, they would be easily exterminated. However, this means that the Rebel Alliance needs daring men and women to supply its freedom fighters with weapons, medicine, and the equipment they need to keep fighting the Empire. These smugglers constantly put their life at risk to serve the Rebellion, and with the Alliance Smuggler Ally Pack, you can bring their bold skills to your games of Imperial Assault! 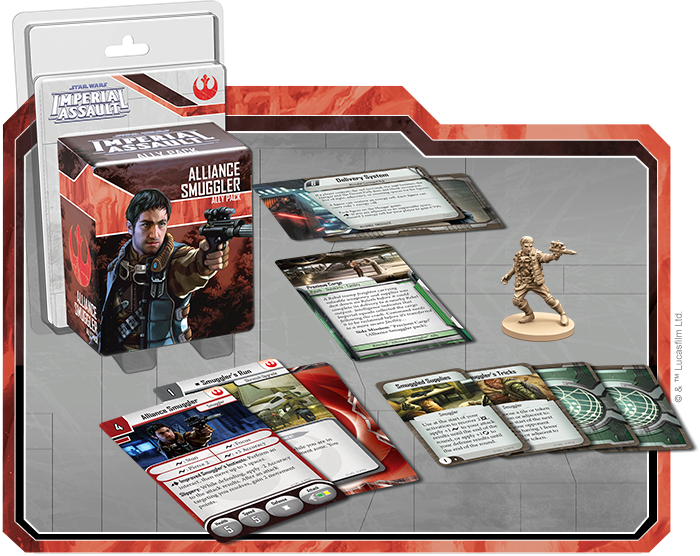 After the fashion of other Ally Packs and Villain Packs, the Alliance Smuggler Ally Pack includes one sculpted Alliance Smuggler figure, new missions for the campaign and skirmish games, and an assortment of new Mission cards, Command cards, Deployment cards, and Skirmish cards. 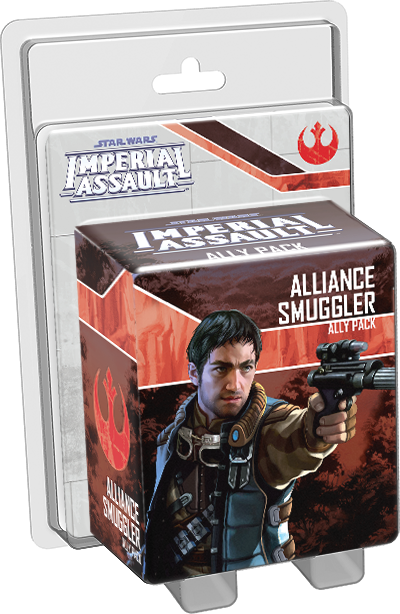 Unlike other figure pack expansions, however, the Alliance Smuggler Ally Pack has no corresponding larger expansion, meaning that the Alliance Smuggler enters the game for the first time in this expansion. Today, we’ll move to the Outer Rim of the galaxy and explore the daredevil life of an Alliance Smuggler in the Star Wars universe! For just two points, you can hire the services of an Alliance Smuggler for a campaign or a skirmish. The Alliance Smuggler works alone as the only figure in his squad, and although his health is low, he can strike from range and spend his surges to gain accuracy, pierce armor, or Stun his targets. Your opponent may have a more difficult time injuring the Alliance Smuggler than he expects, however. 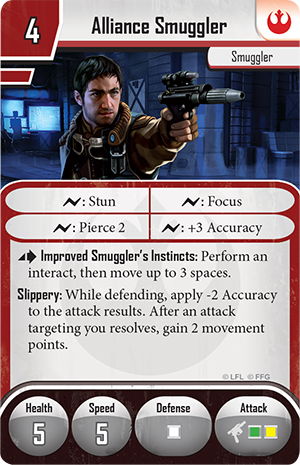 Smugglers are known for being quick on their feet, and the Slippery ability allows you to reduce the accuracy of any attack made against the Alliance Smuggler. Then, after an attack targeting the Alliance Smuggler resolves, he gains two movement points, which he can use to dodge away from future attacks. The Alliance Smuggler can also spend an action to use the Smuggler’s Instincts ability, which allows him to perform an interact action, then move up to two spaces. The interact action can be used for a variety of effects, depending on the mission, but its most common uses are to open a crate or a door. Although allies cannot interact with crates during a campaign, the Alliance Smuggler may use his Smuggler’s Instincts to dart around the map, opening doors before running back into cover and taking shots from the shadows. You may also choose to invest two more points to hire an elite Alliance Smuggler for your team. For two additional points, you gain significant benefits. The elite Alliance Smuggler features improved health, speed, and surge abilities. Not only can this version of the Alliance Smuggler spend a surge to pierce more armor or gain more accuracy, he can spend a surge to Focus, granting him an additional die for his next attack. And if all that weren’t enough, the elite Alliance Smuggler has the Improved Smuggler’s Instincts ability, which allows him to perform an interact and then move up to three spaces. 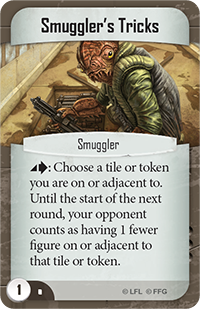 In your Imperial Assault campaigns, the Alliance Smuggler can become a valuable asset. This Ally Pack introduces a new campaign side mission—Precious Cargo—that challenges you to help a shot-down Rebel smuggler recover his vital supplies and escape before the Imperial threat becomes overwhelming. If the Rebel heroes can successfully retrieve the cargo and make it to the extraction point, they gain the Alliance Smuggler as an ally that can be included in your later missions. During a mission, the Alliance Smuggler can’t stand up to concentrated firepower. However, you don’t need him to rush into a firefight to be useful. With the Slippery and Smuggler’s Instincts abilities, the Alliance Smuggler is perfectly suited to opening doors and dodging out of the way, staying at long range and taking potshots at Imperial forces. Even if the Imperial player does decide to focus his attacks on the Alliance Smuggler and defeat him, every attack against the Alliance Smuggler is an attack not directed at your heroes! The Alliance Smugglers can also be a potent force as part of your skirmish strike teams. You may choose to use Alliance Smugglers as background skirmishers. By staying out of range of your opponent’s melee combatants, the Alliance Smugglers can harry your opponent’s strike team, picking away at them from range. 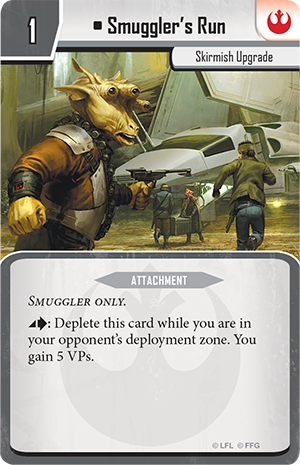 The high speed and Slippery ability of the elite Alliance Smuggler also make this unit excellent for completing objectives, especially objectives that involve transporting tokens. Alternatively, you can assign your own mission to the Alliance Smugglers with a new skirmish upgrade card, Smuggler's Run . Smuggler’s Run is an attachment that can be given to any Smuggler unit. 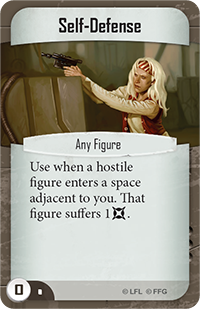 As an action, you may deplete Smuggler’s Run while the attached figure is in your opponent’s deployment zone to immediately gain five victory points. In other words, Smuggler’s Run plays into the Rebel Alliance’s penchant for completing objectives to gain victory points, rather than crushing your opponent’s strike team. As your other figures work to complete the main objectives, you can send a single Alliance Smuggler to slip past your foes and enter the enemy deployment zone in exchange for the victory points to push you closer to victory. You may also supplement your skirmish team with the new Command cards included in the Alliance Smuggler Ally Pack. 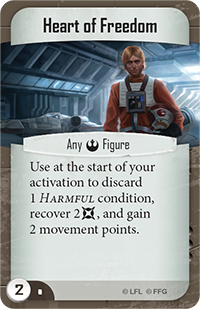 Any Rebel figure can take advantage of the Heart of Freedom Command card, which allows a figure to discard a Harmful condition, recover two damage, and gain two movement points—all without using an action! Alternatively, you may play Self-Defense when a hostile figure enters a space adjacent to you, causing that figure to suffer a damage. The final Command card included in this figure pack completely changes the way you’ll go about your missions. You may play Smuggler's Tricks on one of your Smuggler figures to choose a tile or token the figure is on or adjacent to. Until the start of the next round, your opponent counts as having one fewer figure on or adjacent to that tile or token! For many missions, this Command card can completely tip an objective in your favor, but it can be used during any mission to seize control of a terminal, giving you more Command cards and spurring you closer to victory. Whether you’re smuggling supplies to remote Rebel enclaves or staying two steps ahead of Imperial Stormtroopers, you can benefit from the skillful help of the Alliance Smuggler. Pre-order your copy of the Alliance Smuggler Ally Pack at your local retailer today!